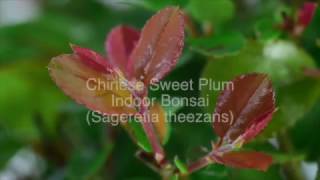 The Sweet Plum is a lovely indoor bonsai tree with lovely proportions and small purple fruits during summer. A highly refined set of twin bonsai with lovely foliage pads and trunk flow. An outstanding ornamental and artistic bonsai with incredible styling and proportions. Potted into a classic sea blue rectangular pot with matching drip tray. Bridge of Unity included - bonsai of harmony - two well balanced trees with elegant trunk flow & exposed roots system for more age & character. Would make a fantastic anniversary gift, bonsai in harmony together symbolising love and devotion. A lovely indoor twin bonsai which display small purple fruits as they mature. Potted into a lovely sea-blue pot with ornamental 'bridge of unity' and matching drip tray. * Pot details: Beautiful sea blue glazed rectangular ceramic bonsai pot.